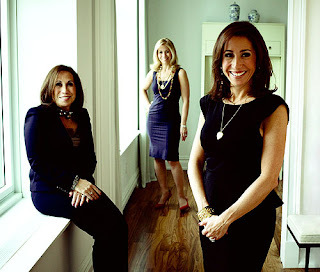 From Realtor Reality Stars to Authors: Penn alum sisters have "Hot Property"
Remember the story I did about the Penn alumni sister realtors who have their own show on HGTV? Well, not only is their fourth season of "Selling New York" about to debut in October, but the Kleier sisters teamed up with their mom and published a new novel called Hot Property. After the jump, learn more about the novel and find out how they managed to get Penn into the book and Penn alumni onto their show! Having risen to the top of the heap as New York City residential real estate brokers—and as the stars of HGTV’s Selling New York, Real estate family Samantha Kleier-Forbes (C'94), Sabrina Kleier-Morgenstern (C'98) and their mother Michele Kleier now give readers an exclusive peak inside the fabulous world they inhabit with their first novel, Hot Property. Appropriately, this tantalizing novel revolves around a mother and daughter trio who sell out-of-this-world properties to the city’s rich and famous, while juggling their personal triumphs and tribulations. "Elizabeth Chase, owner of Chase Residential with her husband, Tom, is a Liz Taylor look-alike who cares most about three things—her family, her beloved dogs, and closing the deal. Her daughters, Kate and Isabel, work alongside their parents in the wildly successful mom and pop boutique agency. The family, which includes younger brother Jonathan, is inseparable—there is no one they would rather spend time with than each other. They consult each other on everything, and Kate and Isabel, who share their own two-bedroom, two-bath, are just as likely to be found at the pre-war “classic nine” on Park Avenue where they grew up. When they’re not pounding the Manhattan pavement selling real estate, that is. Savvy, modern businesswomen, the Chases are also unapologetic romantics who love nothing better than to curl up with a classic film on the DVD player. Kate’s on-again, off-again relationship with her unfocused college beau, Scott, is in one of its “off” periods, so it is with mixed emotions that she hears Isabel’s ecstatic news: she’s engaged to her own love, Michael, a rising actor. Of course Kate is thrilled for her sister and best friend, but as the eldest she always hoped she’d be the first down the aisle. Scott won’t completely disappear from her life, though, and despite attempts at dating eligible men, Kate still believes he is the one. Isabel, meanwhile, must convince Michael that her constant devotion to her mother and sister does not diminish the love she feels for him. But relationship woes often must take a backseat amid the everyday demands of high-stake real estate transactions. As the three Chase women show some of New York’s most fabulous properties to a coterie of clients, trouble may be brewing back at the office. One of their top salesmen, Teddy Wingo has been behaving strangely—failing to show up at a walk-through and resurfacing with a curious story about having been drugged by a girlfriend. Rumors begin to circulate about Teddy’s suspicious behavior, and Elizabeth and Tom contemplate the best plan of action. Although they wouldn’t mind if Teddy would change agencies, they don’t want to jeopardize a sweetheart deal he’s been trying to negotiate. Meanwhile, Isabel’s new client, a wealthy countess named Delphine, is showering her with thoughtful and pricy presents just for showing her properties. The youngest of the Chase women is flattered, drawn under this generous client’s spell—but is there a dark truth about Delphine that Isabel can’t begin to imagine? Each chapter of HOT PROPERTY begins with a luscious real estate listing featuring a multi-million dollar property, and as the Chases navigate through the marketing and selling of these dream residences, they are immersed in a world of power and celebrity in the upper echelons of New York society. Filled with countless details about the singularly glamorous New York life, this delightful bauble of a novel bears the trademark Kleier style—fast and flashy, savvy and sincere. " "But at this moment Kate’s thoughts are elsewhere, focused on Scott, her boyfriend since the summer after her junior year at the University of Pennsylvania, someone with whom she’s had a long and tumultuous history, an onagain, off-again relationship that sometimes makes her wish they’d never been introduced that night at Smokey Joe’s near campus—a bar they always said reminded them of Cheers, where’d she’d gone with a couple of girlfriends for lemon drop shots (their college favorite). Scott, who’d already graduated and come back to visit friends, had been standing at the bar with a couple of fraternity friends, one of whom, Michael Prescott, would later become her sister Isabel’s boyfriend. Though her junior year feels long ago now, Kate remembers that night she and Scott met, and how, even in that hot, noisy bar where Neil Diamond’s “Forever in Blue Jeans” was playing on the jukebox, they had an impassioned conversation about Al Filreis, an English professor they’d both adored, a shy, middle-aged man with a Vandyke beard who lectured quietly but brilliantly about Shakespeare’s early plays. At some point, she recalls, Scott left his friends, and she left hers, and the two of them strolled along Locust Walk through the College Green and beyond, ending up at Franklin Field, Penn’s football stadium, where Scott pressed her against the wall and kissed her so sweetly and so ardently that she felt herself falling for him right then and there." "She drops her Vuitton Speedy bag onto the table in the entrance hall, ignores the copies of Vogue and New York Magazine that arrived in yesterday’s mail, walks across the large soft, white rug, and sinks into the delicious purple velvet Shabby Chic armchair in the living room across from the big built-in bookcases that are spilling over with her favorite novels from her and her sister Isabel’s days as English majors at Penn. They have saved every book they ever read, from Edith Wharton’s Age of Innocence to her favorite Henry James story, the novella Daisy Miller, to D. H. Lawrence’s Sons and Lovers, which they both read the spring of their junior year on the lawn of Horace Mann with their favorite English teacher, Dr. David Schiller." Danielle Mandelbaum (C'94) appeared on Season 2 looking for houses with Samantha and finally bought a property in the Hamptons. Valerie Feigen (C'85) - appeared on Season 2 and acted as a consultant for the Kleiers when the family was hiring new brokers. Valerie tested them and had them show her listings and rated them. She will be throwing a book launhc party for the Kleiers at her boutique, "Edit"